With the expanding role of microfluidics in biology and medicine, methodologies for on-chip fluid sample manipulation become increasingly important. While conventional methods of microfluidic actuation, such as pneumatic and piezoelectric valves, are well characterized and commonly used, they require bulky external setups and complex fabrication. To address the need for a simple microfluidic actuator, we introduce a hybrid device consisting of an electroactive polymer that controls the shape of a microfluidic channel with an applied bias voltage. 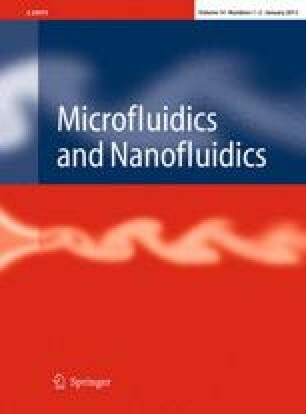 The electro-adaptive microfluidic (EAM) device allowed tuning of fluidic resistances by up to 18.1 %. In addition, we have shown that the EAM device is able to clear microchannel blockages by actively expanding the channel cross section. Biocompatibility tests show the EAM device has little effect on cell viability within a voltage range and thus has the potential to be utilized in bio-microfluidic systems. All of these results indicate that this EAM device design may find use in applications from cell sorting and trapping and self-clearing channels, to the reduction of lab-on-a-chip complexity via tunable channel geometries. C. Murray and D. McCoul contributed equally to the study. The online version of this article (doi: 10.1007/s10404-012-1055-y) contains supplementary material, which is available to authorized users. The authors would like to thank Mohsen Khoshnevisan for his guidance and support and the Defense Advanced Research Projects Agency (DARPA) contract # N66001-10-1-4072 for financial support.